The frost will soon be on the pumpkins – thousands of them! And, the changing leaves will stage yet another dramatic and colorful curtain call on summer pleasures. Because autumn is just so gorgeous in the rolling hills and valleys of the southwestern corner of New York State, many people come to enjoy outdoor pursuits. Rest assured: Whether you’re here to camp at New York’s largest State park, take a hike or a canoe trip, or maybe just to enjoy a lazy drive in leaf peeping season, you’ll find many ways to satisfy all your appetites. Autumn is definitely celebration time here. Historically known as the “Grape Belt of America” – it now boasts more than tens of thousands of acres of grapevines – that means grape juice and wine! All over the region, you’ll find you-pick orchards for apples and squashes, and farm stands piled high with the late crops of the growing season. You can attend a traditional Iroquois or Oktoberfest dinner, visit the area’s most famous cheese shop, tour a working cider mill, stock up on garlic (to eat and to plant in your own garden), or just stop at a local diner for a good cup of coffee and some fresh baked goods. While you’re exploring, take a guided tour of Amish country too: you’ll enjoy delicious meals along the way. And, who knows? You may pick up a few jars of apple butter and fruit preserves, even a loaf of crusty homemade bread to perfectly complement that good bottle of local Concord wine you enjoyed at the requisite vineyard tasting. Experience pre-Colonial Iroquois dining on Seneca Nation Territory; roast turkey, venison, traditional vegetable dishes, desserts – a unique experience! 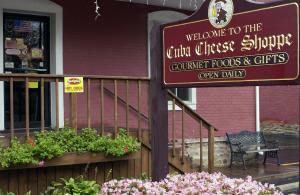 Vast selection of NYS cheddar cheeses & other savory delights; a truly tasty place! Ellicottville’s oldest, largest “leaf-peeping” festival; unique foods on a lively weekend! Fresh-pressed apple cider; pumpkin baked goods; grill menu (BBQ pork, chicken), chili, and more – fall family fun! Following a scenic (and guided) hike, enjoy a tasty Oktoberfest meal, complete with sauerkraut, bratwurst, sausage, hot cider and other fine trimmings.